Bone scintigraphy (BS) is the standard imaging technique for searching bone metastasis in prostate cancer patients. The presence of bone metastasis is important as it changes the stage and the treatment approach in prostate cancer. To reduce the unnecessary use and cost, various guidelines recommend ordering BS only in high-risk patients or patients with bone symptoms.,,, There are slight differences in the definition of high-risk prostate cancer by various sources.,,,, Definition of high-risk prostate cancer by D'Amico et al. is prostate-specific antigen (PSA) ≥20, Gleason score (GS) ≥8, or clinical stage ≥T2c. The National Comprehensive Cancer criteria for high risk is clinical stage T3a, Gleason score 8 to 10/Gleason grade group 4-5, or PSA level greater than 20 ng/ml. In the past 10 years, there has been increasing use of F-18 sodium fluoride (NaF) positron emission tomography/computed tomography (PET/CT) bone scan in the detection of metastatic diseases in various cancers. NaF PET/CT has mostly replaced BS in many hospitals and diagnostic centers equipped with PET/CT camera. The main advantages of NaF PET/CT bone scan over BS are improved image resolution and contrast with high bone-to-background uptake ratio. The low-dose CT component of the study is not only used for soft-tissue attenuation correction of the photons emitted by PET radiotracers but also utilized for anatomic localization of PET uptake and correlation of PET with CT findings (lytic or sclerotic lesion, osteophyte, etc.) which improves the specificity of this study. In addition to high technologic features of PET/CT cameras, bone PET radiotracer, F-18 NaF, is an excellent bone imaging agent. Its extraction by the bone tissues is proportional with the blood flow and osteoblastic activity. F-18 NaF has faster blood clearance and approximately 2-fold higher uptake in bone than the Tc-99m-based BS radiotracers. Studies have demonstrated higher sensitivity of NaF PET/CT over standard BS in patients with osteoblastic metastases.,,, PET can detect small lesions, particularly sclerotic lesions, and early metastatic disease.,, The sensitivity/specificity of BS and NaF PET were determined as 70%/57% and 100%/100%, respectively, by Even-Sapir et al. and 51%/82% and 93%/54%, respectively, by Poulsen et al., Low specificity of PET in the Poulsen's study was assumed to be due to false-positive lesions due to degenerative changes in the elder population. However, careful evaluation of the PET, CT, and PET/CT fusion images usually helps to differentiate degenerative from metastatic disease. In cases with coexisting degenerative and metastatic disease in the same vertebra, careful evaluation of the images with reducing PET image intensity and comparing with CT findings usually helps not missing metastatic disease adjacent to the degenerative changes. PSA cutoff value for ordering BS in patients with prostate cancer has been previously published by various studies, mainly in newly diagnosed patients.,,, However, a PSA cutoff value for ordering NaF PET scan has not been reported yet. Given its higher sensitivity in detecting small and early bone metastasis, PSA cutoff value for positive NaF PET/CT may be less than that with BS. In this study, our goal was to determine PSA cutoff values for NaF PET/CT scan in newly diagnosed and previously treated prostate cancer patients. Prostate cancer patients either newly diagnosed or previously treated who had NaF PET/CT bone scan and PSA measurements available within 2 months of PET study were selected for this study. When available, other parameters (GS, clinical stage, alkaline phosphatase levels, skeletal symptoms, and correlative imaging findings) were recorded. NaF PET/CT bone images were provided from two institutes (Mubarak Al-Kabeer and Trakya University Hospitals). This retrospective study was approved by Kuwait Ministry of Health and Ethics Committee at Trakya University Faculty of Medicine. NaF PET/CT bone images were obtained at Philips Gemini Time-of-Flight 64 PET/CT and GE discovery 8 PET/CT cameras. Sixty minutes following intravenous injection of 222 MBq (6 mCi) of F-18 NaF, first, a low-dose CT and then PET images (3 min/bed) were obtained from top of the head to toes. Iterative reconstruction was used for image processing. Images were evaluated by two readers using attenuation corrected and uncorrected PET, CT, and PET/CT fusion slices in transaxial, sagittal, and coronal planes and maximum intensity projection image. 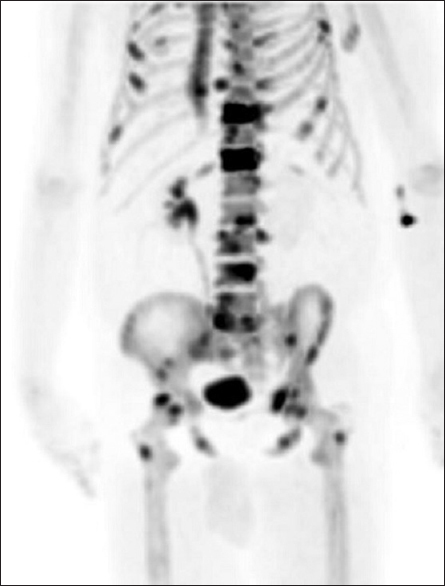 PET/CT findings were reported as positive, negative, or indeterminate for bone metastasis. Serum total PSA concentrations were determined based on enzyme immunoassay. Normal PSA range in our laboratories is 0.0–3.0 ng/ml. Receiver operating characteristic (ROC) analysis was performed to determine PSA cutoff values for NaF PET/CT imaging in newly diagnosed and previously treated patients. Sixty-two patients with prostate cancer met the inclusion criteria. Thirty-two patients were newly diagnosed (Group 1, mean age: 67.2 years, range: 52–90 years) and 30 patients were previously treated (Group 2, mean age: 73.9 years, range: 61–95 years). In Group 1 (32 newly diagnosed patients), 10 patients were symptomatic showing bone pain and rest were asymptomatic. [Table 1] shows the PET results of this group. PET was positive in 9 patients (PSA mean: 91.6 ng/ml, range: 6.2–226 ng/ml). Majority of PET-positive patients (7/9) had PSA value of >20 ng/ml. In a PET-positive patient with GS of 8, PSA was 6.2 ng/ml [Figure 1]. In PET-positive cases, 7 patients were asymptomatic and 2 were symptomatic. In symptomatic patients, PSA was >100 ng/ml. [Figure 2] demonstrates a PET-positive study (multiple metastasis) in a patient with PSA of 77.5 ng/ml and GS of 7. PET was negative in 10 patients (PSA mean: 6.55 ng/ml, range: 0.01–15.7 ng/ml) and indeterminate in 13 (PSA mean: 14 ng/ml, range: 0.87–31.3 ng/ml). Radiological correlation (RC) was available only in 9 patients in this group. RC was negative in 2 PET-positive and 2 PET-negative patients. RC was positive in 1 PET-positive and 1 PET indeterminate patient. In 3 other patients (2 PET-positive and 1 PET indeterminate), RC was limited to pelvis only which was negative. GSs were available only in 13 patients in this group. GS were 9, 9, and 8 in 3 PET-positive, 7 and 6 in 2 PET-negative, and 6, 6, 6, 7, 7, and 8 in 6 PET indeterminate patients. ROC analysis indicated that PSA cutoff value for PET positivity was >20 ng/ml in this group with newly diagnosed prostate cancer patients. In Group 2 (30 previously treated patients), 17 patients were currently on hormone therapy, and patients had rising PSA and/or bone pain. [Table 2] shows the PET results of this group. PET was positive in 6 patients (PSA mean: 146.4 ng/ml, range: 6.6–675 ng/ml). In 2 PET-positive patients (GS: 9 and 8), PSA values were <10 ng/ml (6.6 and 7.35 ng/ml). In another PET-positive patient, PSA value was <20 ng/ml (17.4 ng/ml). In 3 PET-positive patients, PSA was >20 ng/ml. Five of 6 PET-positive patients were on hormone therapy. In this group, PET was negative in 14 patients (PSA mean: 3.4 ng/ml, range: 0.01–13 ng/ml) and indeterminate in 10 (PSA mean: 4 ng/ml, range: 0.01–35 ng/ml). RC was available only in 9 patients in this group. RC was positive in 2 PET-positive, 1 PET-negative, and 2 PET indeterminate cases. RC was negative in 1 PET-negative and 3 PET indeterminate cases. GSs were available in 18 patients in this group. GSs were 9, 7, 6, and 6 in PET-positive, 10, 9, 7, 7, 6, and 5 in PET-negative, and 9, 9, 8, 8, 7, 6, 6, and 5 in PET indeterminate cases. ROC analysis indicated that PSA cutoff value for PET positivity was >6 ng/ml in this group with previously treated prostate cancer patients. Bone metastases are associated with high morbidity and mortality. The presence of bone metastasis changes the stage and the treatment approach. BS is a routine procedure for detecting bone metastases and initial staging of high-risk prostate cancer. In newly diagnosed high-risk prostate cancer, near one-fifth of the patients will have a positive BS on initial evaluation. In the current study, NaF PET was positive in 28% of the newly diagnosed prostate cancer patients. Abuzallouf et al. reported positive BS in 2.3% of men with PSA levels <10 ng/ml, in 5.3% of men with PSA levels 10.1–19.9 ng/ml, and in 16.2% of men with PSA levels 20.0–49.9 ng/ml in newly diagnosed prostate cancer patients. PSA was >20 ng/ml in 77.7% of PET-positive newly diagnosed patients in our study. In the other 2 PET-positive patients, PSA was below 10 ng/ml in one patient and below 20 ng/ml in the other. In various studies, a PSA cutoff value of ≥10 or >10 ng/ml has been recommended for ordering BS in newly diagnosed and untreated asymptomatic prostate cancer patients.,,,,, Other studies have reported a higher PSA cutoff value of ≥20 or >20 ng/ml for ordering BS.,, In our study, we found a PSA cutoff value of >20 ng/ml for ordering NaF PET scan in newly diagnosed patients. However, in high risk or symptomatic patients, NaF PET can be ordered at lower levels of PSA. Although PSA is less reliable following radiotherapy than radical prostatectomy (RP), a rising PSA in treated prostate cancer patients usually indicates local recurrence or metastatic disease. Early detection of recurrent and metastatic disease in patients with biochemical failure after definitive therapy for localized primary prostate cancer is important for appropriate treatment. In patients with rising serum PSA after RP, current serum PSA is accepted as the best predictor of the BS result. Cher et al. suggested that there is limited usefulness of BS until PSA increases above 30–40 ng/ml. In a study by Dotan et al., patients with an increasing PSA after RP, for the PSA levels of 0–10, 10.1–20, 20.1–50, and above 50 ng/ml, BS was positive in 4%, 36%, 50%, and 79%, respectively. Gomez et al. suggested that a BS is unlikely to be positive in patients with a serum PSA of <7 ng/ml on biochemical recurrence after RP, whereas it is likely to be positive when a PSA of ≥20 ng/ml. They suggested that the presence of skeletal symptoms or a PSA level of >7 ng/ml should prompt the clinician to obtain a BS. In our study, PET was positive in 20% of the previously treated patients and PSA was <10 ng/ml in 2 of them. Jadvar et al. reported that in 16.2% of men with biochemical failure only, NaF PET/CT may reveal sites of occult osseous metastases. In the same study in 8 of 10 patients with positive NaF PET/CT, the PSA level was relatively low (range: 1.9–5.83 ng/ml) at levels where conventional BS is often negative. Cook et al. reported that in 11% of high-risk localized prostate cancer with normal pretreatment baseline BS, scan became positive following initial hormone therapy (flare phenomenon). Majority of our PET-positive patients (83.3%) were on hormone therapy during PET scan. The main limitations of our study are the relatively small number of patients as well as lack of uniform follow-up or correlative/confirmatory data in some of our patients. However, the importance of this article is to be the first study determining a PSA cutoff value for ordering NaF PET scan in patients with prostate cancer. In our study, we did not find a major difference in PSA cutoff value for NaF PET and BS in patients with newly diagnosed prostate cancer. However, we found a lower PSA cutoff value in previously treated patients. A study with larger number of patients with follow-up NaF PET scan, correlative radiological imaging, or histopathological confirmation may determine a more accurate PSA cutoff level for ordering NaF PET/CT in patients with prostate cancer. NCCN Guidelines Version 2. Prostate Cancer Updates; 2018. Available from: http://www.nccn.org/professionals/physician_gls/pdf/prostate.pdf. [Last updated on 2018 Mar 08, cited April 2018]. European Assoication of Urology Guidelines on Prostate Cancer. Available from: http://uroweb.org/guideline/prostate-cancer/#4. [Last accessed on 2018 Apr 24]. National Institute for Health and Care Excellence – Prostate Cancer: Diagnosis. Available from: https://www.nice.org.uk/guidance/cg175. [Last published on 2014 Jan 08]. Thompson I, Thrasher JB, Aus G, Burnett AL, Canby-Hagino ED, Cookson MS, et al. Guideline the management of clinically localized prostate cancer: 2007 update. J Urol 2007;177:2106-31. Even-Sapir E, Metser U, Mishani E, Lievshitz G, Lerman H, Leibovitch I, et al. The detection of bone metastases in patients with high-risk prostate cancer: 99mTc-MDP planar bone scintigraphy, single- and multi-field-of-view SPECT, 18F-fluoride PET, and 18F-fluoride PET/CT. J Nucl Med 2006;47:287-97. Even-Sapir E, Mishani E, Flusser G, Metser U. 18F-fluoride positron emission tomography and positron emission tomography/computed tomography. Semin Nucl Med 2007;37:462-9. Langsteger W, Heinisch M, Fogelman I. The role of fluorodeoxyglucose, 18F-dihydroxyphenylalanine, 18F-choline, and 18F-fluoride in bone imaging with emphasis on prostate and breast. Semin Nucl Med 2006;36:73-92. Schirrmeister H, Guhlmann A, Kotzerke J, Santjohanser C, Kühn T, Kreienberg R, et al. Early detection and accurate description of extent of metastatic bone disease in breast cancer with fluoride ion and positron emission tomography. J Clin Oncol 1999;17:2381-9. Desai B, Gross ME, Jadvar H. Multimodality imaging in biochemical recurrence of prostate cancer: Utility of (18)F-naF PET/CT in early detection of metastasis. Rev Esp Med Nucl Imagen Mol 2012;31:231-2. Araz M, Aras G, Küçük ÖN. The role of 18F-naF PET/CT in metastatic bone disease. J Bone Oncol 2015;4:92-7. Poulsen MH, Petersen H, Høilund-Carlsen PF, Jakobsen JS, Gerke O, Karstoft J, et al. 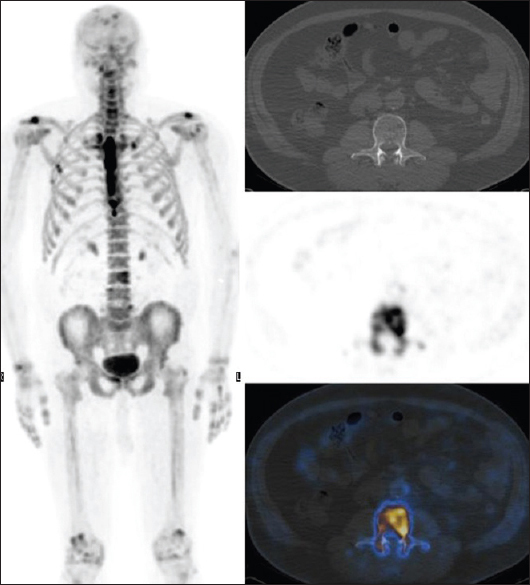 Spine metastases in prostate cancer: Comparison of technetium-99m-MDP whole-body bone scintigraphy, [(18) F]choline positron emission tomography (PET)/computed tomography (CT) and [(18) F]NaF PET/CT. BJU Int 2014;114:818-23. Haukaas S, Roervik J, Halvorsen OJ, Foelling M. When is bone scintigraphy necessary in the assessment of newly diagnosed, untreated prostate cancer? Br J Urol 1997;79:770-6. Oesterling JE. Using PSA to eliminate the staging radionuclide bone scan. Significant economic implications. Urol Clin North Am 1993;20:705-11. Kosuda S, Yoshimura I, Aizawa T, Koizumi K, Akakura K, Kuyama J, et al. Can initial prostate specific antigen determinations eliminate the need for bone scans in patients with newly diagnosed prostate carcinoma? A multicenter retrospective study in Japan. Cancer 2002;94:964-72. Ataus S, Citçi A, Alici B, Onder AU, Sönmezoğlu K, Erözenci A, et al. The value of serum prostate specific antigen and other parameters in detecting bone metastases in prostate cancer. Int Urol Nephrol 1999;31:481-9. Miller DC, Hafez KS, Stewart A, Montie JE, Wei JT. Prostate carcinoma presentation, diagnosis, and staging: An update form the national cancer data base. Cancer 2003;98:1169-78. Gleave ME, Coupland D, Drachenberg D, Cohen L, Kwong S, Goldenberg SL, et al. Ability of serum prostate-specific antigen levels to predict normal bone scans in patients with newly diagnosed prostate cancer. Urology 1996;47:708-12. Rudoni M, Antonini G, Favro M, Baroli A, Brambilla M, Cardani G, et al. The clinical value of prostate-specific antigen and bone scintigraphy in the staging of patients with newly diagnosed, pathologically proven prostate cancer. Eur J Nucl Med 1995;22:207-11. Chybowski FM, Keller JJ, Bergstralh EJ, Oesterling JE. Predicting radionuclide bone scan findings in patients with newly diagnosed, untreated prostate cancer: Prostate specific antigen is superior to all other clinical parameters. J Urol 1991;145:313-8. Kamaleshwaran KK, Mittal BR, Harisankar CN, Bhattacharya A, Singh SK, Mandal AK, et al. Predictive value of serum prostate specific antigen in detecting bone metastasis in prostate cancer patients using bone scintigraphy. Indian J Nucl Med 2012;27:81-4. Kemp PM, Maguire GA, Bird NJ. Which patients with prostatic carcinoma require a staging bone scan? Br J Urol 1997;79:611-4. Cher ML, Bianco FJ Jr., Lam JS, Davis LP, Grignon DJ, Sakr WA, et al. Limited role of radionuclide bone scintigraphy in patients with prostate specific antigen elevations after radical prostatectomy. J Urol 1998;160:1387-91. Dotan ZA, Bianco FJ Jr., Rabbani F, Eastham JA, Fearn P, Scher HI, et al. Pattern of prostate-specific antigen (PSA) failure dictates the probability of a positive bone scan in patients with an increasing PSA after radical prostatectomy. J Clin Oncol 2005;23:1962-8. Gomez P, Manoharan M, Kim SS, Soloway MS. Radionuclide bone scintigraphy in patients with biochemical recurrence after radical prostatectomy: When is it indicated? BJU Int 2004;94:299-302. Jadvar H, Desai B, Ji L, Conti PS, Dorff TB, Groshen SG, et al. Prospective evaluation of 18F-naF and 18F-FDG PET/CT in detection of occult metastatic disease in biochemical recurrence of prostate cancer. Clin Nucl Med 2012;37:637-43. Cook GJ, Venkitaraman R, Sohaib AS, Lewington VJ, Chua SC, Huddart RA, et al. The diagnostic utility of the flare phenomenon on bone scintigraphy in staging prostate cancer. Eur J Nucl Med Mol Imaging 2011;38:7-13.